Native Japanese speaker and J-pop magazine writer offering classes in midtown. Take Free 2 60 min. 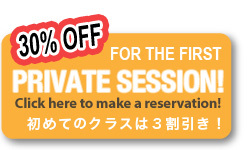 Japanese semi-private lessons, WASABI! Please visit our CLASSES page for details!! Learn Japanese one-on-one at a coffee shop in Manhattan! All levels are available and the format of the class can be tailored to your needs and interests. EX)Resume writing lesson and interview lesson for jobs are available per request,Keigo lesson (speaking,writing,reading) is now available,Japanese newspaper reading lesson is available.